Starting with version 3.7, Power Admin products (PA Server Monitor, PA Storage Monitor and PA File Sight) support using SSL-enabled HTTP (HTTPS) for serving reports, and for console to service communication. Self-signed certificates are used so you have immediate SSL protection without the need to purchase a commercial SSL certificate. You can usually see the cause of the error by opening the URL in question in a browser and looking at what the browser reports about the certificate error. In the image below, we clicked the certificate error and see the root cause displayed. Most SSL certificates come from a well-known certifying authority like Verisign, Thawte, GeoTrust and others. These companies charge for their certificates, which enables them to do some level of check on the company requesting the certificate. Because of this, browsers recognize certificates signed by these Certificate Authorities. With self-signed certs, a Certifying Authority was not involved. That means the product has to sign it's own SSL certificates, and therefore be its own Certifying Authority. Since the browser doesn't know about this new Certifying Authority, it shows warnings indicating it doesn't know whether to trust the SSL certificate or not. To make the browser stop displaying the warnings, you have to install the new Certifying Authority certificate into the browser as a Root CA or Trusted CA. Be careful -- only install a new Certifying Authority when you know who it is because you are telling the browser to trust SSL certificates from that authority. 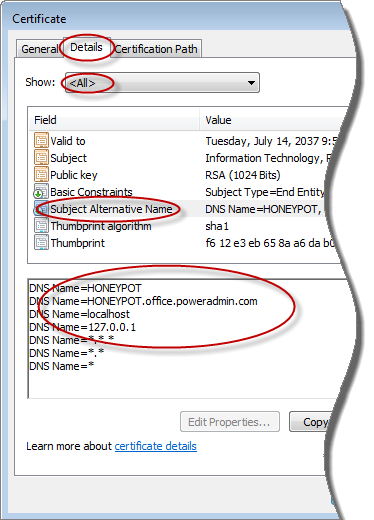 In this case, the Power Admin product created the new Certifying Authority on your computer. No other computer has that Certifying Authority. When the SSL certificate was made, it was created using the computer's name, localhost and 127.0.0.1. In the examples above, that means we could go to https://dnvista or https://localhost or https://127.0.0.1 and the host name in the URL would match the host name listed in the SSL certificate. If you access the page using the host name in the certificate, mismatched host address errors will go away. If you can't access it with the host name in the certificate (perhaps because an external host name is being used) adding a hosts file entry will make it so you can. 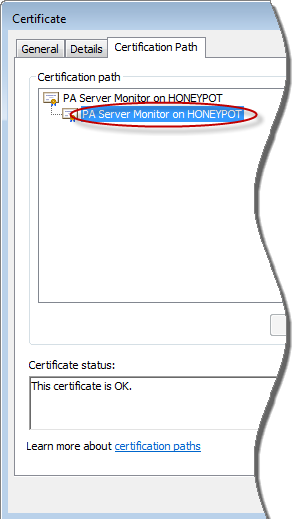 But first, you need to see which host names are in the certificate. Adding a hosts file entry for one of those names that points at the monitoring service will quiet the browser's certificate complaints. Delete the value named SSL_GenSAN. Then restart the service -- when it starts up, a new SSL certificate with the current host name will be created. If you would like to add an additional host name to the Subject Alternative Name field show in the image above, you can do that by setting the SSLSANName field to the new host name. You can add multiple host names by separating them with a comma. Delete the SSL_GenSAN value and restart the service and the certificate will be rebuilt with the new host names. Restart the Console and you should be able to click past the SSL error. You can use the two techniques discussed above this topic to fix the source of the SSL error.